We shall now examine in detail the different stages of the chain order of creation once Tzimtzum had created the vacuum within which finite creation could come about. In order to describe these stages and draw their comprehension closer to our understanding, we shall use an analogy from a builder. Imagine a couple has an idea that they want to build the ideal house for themselves and their family. The idea struck them totally out of the blue. In a flash they had a picture in their mind of a state-of-the-art palatial home with gardens and a pool. Relishing such an idea, the couple then sat down and worked out the entire structure in their mind by visualizing each bedroom, dining room, kitchen, garage, etc. In the mind, the initial idea has been developed in breadth and depth. After such a beautiful dream, they could easily delete the entire image from their mind. However, to carry the idea further, they have to get emotionally excited about the idea. The couple must then call an architect and a builder and start putting the initial idea on paper. Once the plans have been drawn up, our couple then has to go into the practicalities of buying a plot of land, applying for building permission, financing the project, and the actual building of the house. Only after months of work will the house be finished and our couple may then enter the fulfillment of their dream. Kabbalah explains that these four stages were also used in the creation of the world. The first stage was the overall concept. The first level of conceptualization is the initial stage in which the Sefirot become manifest. This level is called the world of Atzilut. The word Atzilut comes from the Hebrew word Aitzel, which means “next to,” or “emanated from.” This world is the next stage after the Tzimtzum of the Or Ein Sof. Once the possibility for finite creation had been made possible through the Tzimtzum, it was then possible to delineate different features or attributes of G‑d. The Torah uses different Hebrew names for G‑d. They are in fact names that describe the different Sefirot. For example, the name E-l describes G‑dliness as manifest in the Sefirah of Chessed. Elokim describes G‑dliness as manifest in the Sefirah of Gevurah, and so on. The world of Atzilut is still within the realm of the Infinite, and each of the Sefirot in the world of Atzilut is infinite. The novelty of the world of Atzilut is the delineation between the attributes. Each one becomes identifiable in its own right. Previously, although the possibility for their creation existed, it was totally obscured by the Or Ein Sof. In the world of Atzilut, all that can be felt is the Divine. There is yet no independent existence. Each of the four stages of creation corresponds to one of the four letters in the Tetragrammaton, G‑d’s four-lettered name of Havaye. The world of Atzilut corresponds to the letter Yud. This letter is shaped in the form of a dot and is the smallest letter from which all other letters are conceived. It is the quintessential point from which all further existence may develop. As explained earlier, the letter Yud also corresponds to the Sefirah of Chochmah. Although all ten Sefirot are present in every world, one Sefirah (or a group of Sefirot) is predominant at each stage. The dominant Sefirah in the world of Atzilut is Chochmah. The world of Atzilut is the revealed potential of further creation. In the next stage, the initial concept is worked out, and plans for the creation are further developed. Within the mind, the building has taken on some form of independent existence. Something has been created, albeit only in theory. This world is called the world of Beriah (creation). The word “creation” always implies creating something (yesh) from nothing (ayin). In Beriah, the initial concept of Atzilut has been broadened, both in length and depth. The letter Hey corresponds to the Sefirah of Binah, which is the predominant Sefirah in Beriah. Binah takes the initial concept of Chochmah and develops it in all its detail. The world of Beriah takes the initial manifestation of the Sefirot in Atzilut and creates with them some form of existence which starts to take on independence. Although in Atzilut there is total “nullification” (Bittul), nothing exists independently. What is felt in Beriah is also the Divine, however, unlike in Atzilut, in Beriah there is something outside of G‑d that is feeling Him while still being totally nullified. It is for this reason that the world of Beriah is called the world of the “Divine Throne”— Kisei Hakavod. In essence, a throne is a chair upon which man lowers his posture. So too, the Divine Throne is the idea of the Divine lowering itself to come into contact with the worlds. This lowering of posture takes place in the world of Beriah. It is also in the world of Beriah that we find the creation of souls and the highest angels. Angels (malachim) are not white-winged creatures that fly across the sky. Rather, they may be conceived of as conduits for Divine energy flow. They act as agents through whom energies flow to this world. The angels in the world of Beriah are called Seraphim, from the Hebrew word Seraiphah (a fire). These angels are so infused with feeling that they “burn up.” This is not to be taken in the literal sense, but that they are so close to G‑d that they cannot endure the intensity, and are in a constant state of spiritual ecstasy. The world of Beriah is also the place of the upper Garden of Eden, which is an abode for souls that have merited entering this most sublime realm as a reward for their efforts in this world. The next stage is the world of Yetzirah (formation). It is in this world that finite plans are drawn up for actual creation. 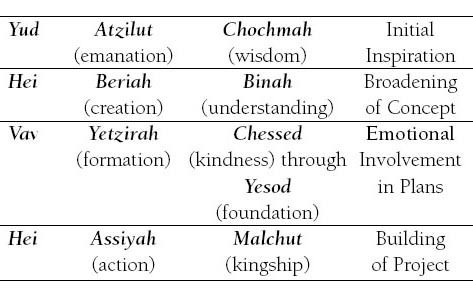 The predominant Sefirot in this world are the six emotional Sefirot from Chessed to Yesod. They correspond to the letter vov in the name Havaye (vov numerically equals the number 6). This world is where emotional attachment to the project forms and it takes on a momentum of its own. The entire project is no longer merely a concept and concrete steps are being taken to actualize the idea. Here exists the lower Garden of Eden, the abode for souls who merit basking in its Divine Light. This is the realm of the angels called Chayot Hakodesh (lit. “holy beings”). The angels in this world take on names corresponding to the Sefirot. For example, the angel Michael corresponds to the Sefirah of Chessed, Gabriel to Gevurah, and Raphael to Tiferet, etc. When we recite Kedushah in the repetition of the Amidah, we say “Kadosh” (holy) three times. This is a reference to the angels of Beriah, Yetzirah, and Assiyah; all of whom pay homage to G‑d in their different ways. Ezekiel’s prophecy was experienced when he entered the world of Yetzirah through meditative techniques. Since he wished to communicate this experience to his people, he had to use human language to describe metaphysical phenomena. In the world of Yetzirah, he describes the angels there in the form of creatures. Below him were the Ophanim, the angels of the world of Assiyah. Throne of the world of Beriah was above him. Sitting on the Throne was the form of a man describing the Sefirotic array in the world of Atzilut. Isaiah’s prophecy entered an even deeper state within the world of Beriah, and subsequently, his description is much less detailed. Finally, the fourth world is Assiyah (the world of action), where the creation is actualized. The Divine creative flow from the world of Yetzirah flows down through the angels into the creation of the four kingdoms: Mineral, Vegetable, Animal, and Human. The predominant Sefirah in the world of Assiyah is Malchut. Malchut suggests sovereignty—the idea of a distant king ruling over willing subjects. Assiyah is the world in which the creation takes on a form of total independence, yet the place where the subjects accept G‑d as King. The world of Assiyah is somewhat contrary. The Master Creator, who is a supreme artist, has created a most beautiful and diverse creation. It is a creation of G‑d alone, yet G‑d is hidden to the degree that His creations are not aware of their Creator. Somehow it is possible in this world to totally deny the presence of G‑d, as He is completely concealed. It is this total concealment that allows this world to be a realm of free choice, where a person can choose to serve or ignore, as well as the realm of challenge, where the hand of G‑d is sometimes overt and at other times covert. This world is the ultimate purpose of creation, and it is here that G‑d wishes His creatures to create an abode for Him. This is achieved through adherence to Torah and Mitzvot. In Torah, G‑d has communicated the truth of creation and provided a path through which people can navigate the choppy waters of life. This is accomplished at every stage by attaching themselves to Him through Mitzvot. In the higher worlds what is manifest is the Divine Light. In reality, they are only manifestations of the Divine creative ability; mere rays out of the sun. However, it is in this world, where one cannot perceive the Light manifest in the higher realms, that one can truly appreciate Atzmut (essence of G‑d). In this world, we perceive ourselves as separate and distinct from the flow of G‑dliness, and it is this feeling of being apart that permits us to behold the essence of G‑d to a greater degree. Ironically, there is a vantage point to the observer in this world. In the higher worlds, one is blinded somewhat by rays of the “Divine Light” (Giluyim). The higher one goes, either in the lower or higher Garden of Eden, the more sublime the revelation and the more blinded a person is. Yet, from Earth, we can appreciate the sun in a far greater manner. It is specifically in this realm where there is a total eclipse of this Divine Light that the observer can actually come into contact with Atzmut Himself. Though He stands far beyond comprehension, one can observe creation and realize that this can only be the work of G‑d Himself. worlds and their meanings. It's funny that the more I learn the more I want to know. i.e. That Atzilut has it's manifestation through Keter. It would be inappropriate for that Who IS WAS and WILL BE to start with 2.
great article I am new to the study of Kabbalah and find this article extremely helpful in understanding the concept of the four worlds.